my last post. When I get home I will upload an image of that one so I can share the completed piece. I have commented in the past about how much I enjoy working in black and white. 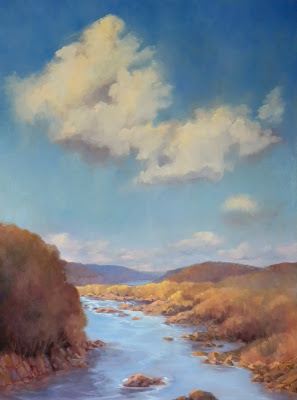 For those of you just starting out I highly recommend this as an excellent exercise in seeing relative values and concentrating on composition. It is easier to do so when you are not making color decisions and mixing paint. my signing brush at home and the paint had set up too rapidly for me to scratch in a signature. It will have to wait. I hope I will have some work worth sharing over the next couple of days. Until then I wish you a very Happy New Year! This painting which I have titled "24 Hour Cafe" was inspired by buildings here in DC along H Street. I used a lot of artist's license to create a scene that could be in Greenwich Village as easily as in DC. I am heeding the saying " know your audience". Since we have been enjoying our first couple of snows I decided to add that to the scene. Below was taken at the American Paintings reception for Small Treasures. Those of you who read my last post will remember my sense of optimism about this painting. Uh huh. Well this blog is about the ups and downs of being an artist and today I feel this painting has the makings of a real stinker. When I am on a roll I need to keep going and letting a painting sit for days often causes me problems. This one has plenty of problems! On top of everything I uploaded a ghastly photo in that last post because it was more expedient to use my iPhone than go get my camera. The above image is closer to the truth. I am hating the buildings on the left. The brushwork is boring and I need to find a way to address that or this is going to get a sanding and a couple of coats of gesso! I will no doubt stick it in the closet for a while before the final verdict. I would like to think there is still a painting in there. To make myself feel better I returned to The Farmhouse. It is great at times like this to turn to something that makes me feel confident and able to then return to the tough ones. I guess you can tell by now that I don't seem to tire of painting this beautiful property. 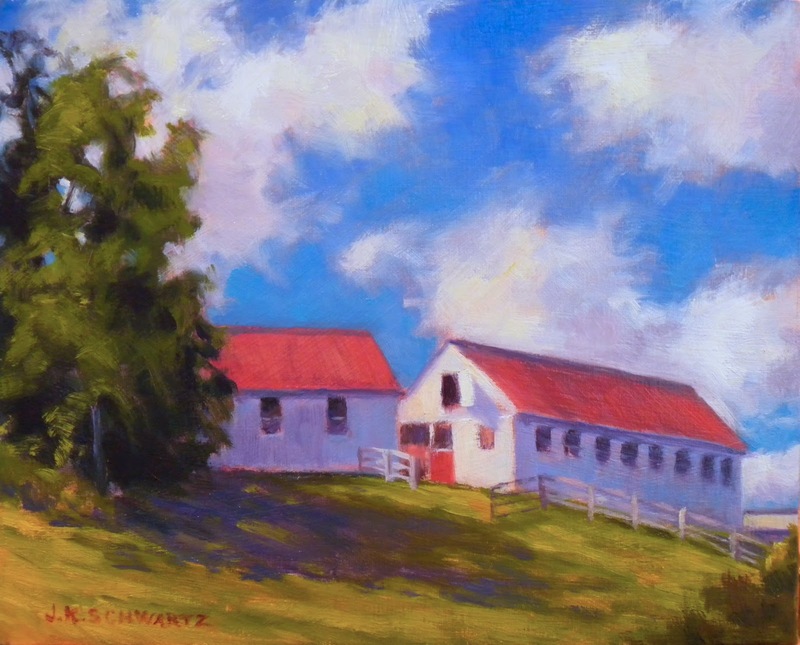 I love the barn, I love the farmhouse and I really love the view high over the Potomac. Another plus is that painting here lets me maximize the time spent enjoying this very pleasant weather. I can ride my mare Gypsy and then head off to the spot of my choice and paint. This is the third barn painting I have uploaded here in recent weeks. I don't know how many times I have ridden that path home to the barn in the last 30 plus years. I enjoy painting what I know and what I love. When you see the image of the painting on the easel in the photo below you will realize that I have curved the path that in reality is straight. I painted it straight but when I got home I felt that a curve would be much more fitting in the painting. 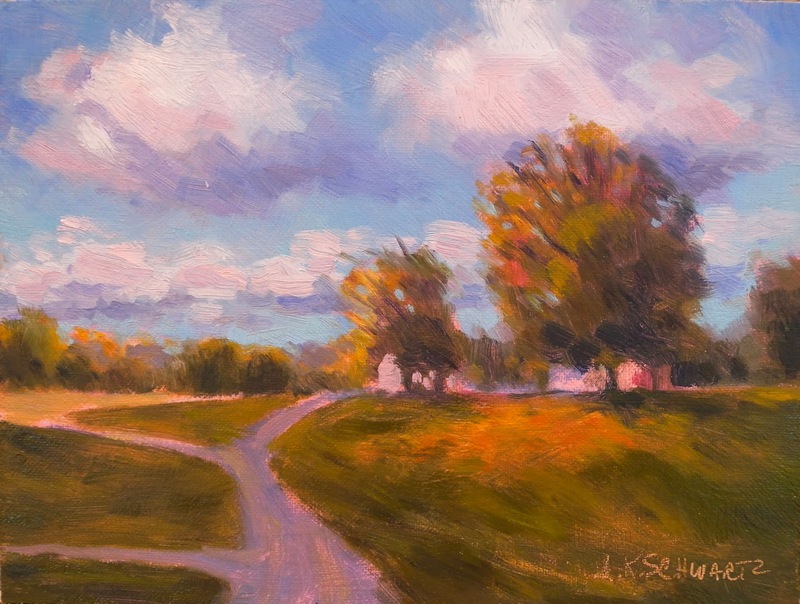 The only other adjustment I would like to make is a refinement of the foreground shadow. It is okay as it crosses the path but it is too heavy as it crosses the lawn. I think the shadow to the right of the tree is much more successful. Then all I have to do is sign and frame. Today I completed this small painting that I had started earlier this week. 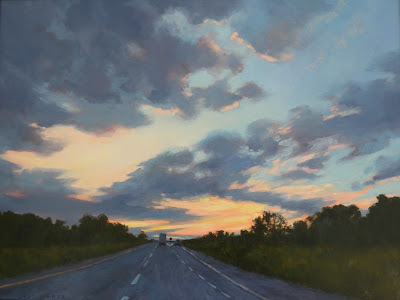 It is on of my "from the road" paintings which is what I call those paintings that are inspired by what I see while being a passenger in the car. 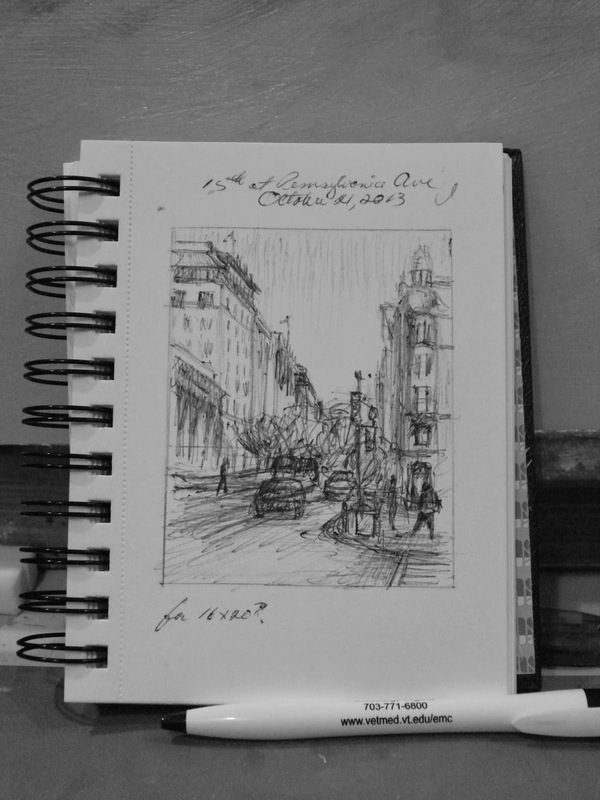 I took a quick photo with my i phone and did a rapid fire scribble in my 4x6 sketchbook before the light turned red. I find it is great fun. There is no other way I could create this image. The sky was so wonderful that late afternoon and I loved the fact that the Capitol building was not center stage but rather part of the backdrop. Road work was being done on the crosstreet and I was tempted to do this in a wider format to include some of that on the right. Instead I opted to just include one of the workers in his safety vest. I think his job was to make sure drivers took care when making a right turn. The red on the commercial building was another asset helping to make this a colorful scene. Here is my quick sketch. You can see from my notes that I had planned on doing this as a 16x20 but with the upcoming small works shows in mind I decided on 9x12 instead. 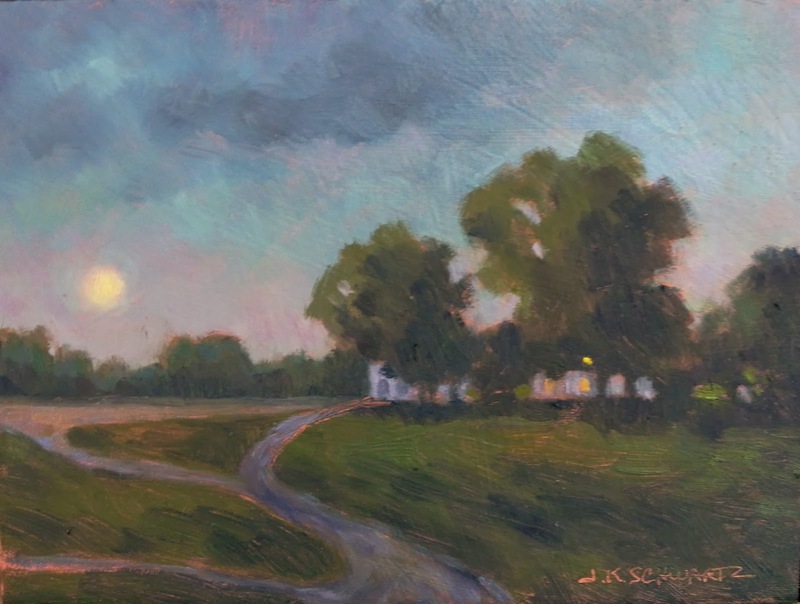 This one will be heading to American Painting Gallery on MacArthur Boulevard in November. I know there are typos here but I continue to be unable to backtrack and make corrections so you will have to read this in the raw:) I have found a way to work around the problems with the site so I can continue posting but it is not the way I would like it to be! 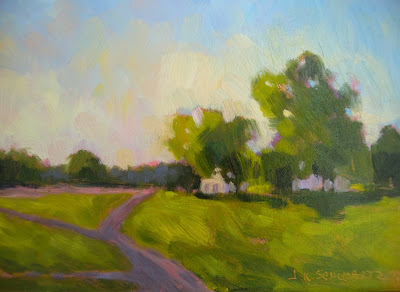 The summer is rolling by and there is so much I had planned on painting that I fear I will run out of time. Time management is always a challenge for me. There never seem to be enough hours in the day to do all I need to do. 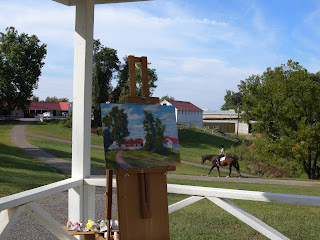 Most mornings are spent with my horse on the beautiful property you see painted here. 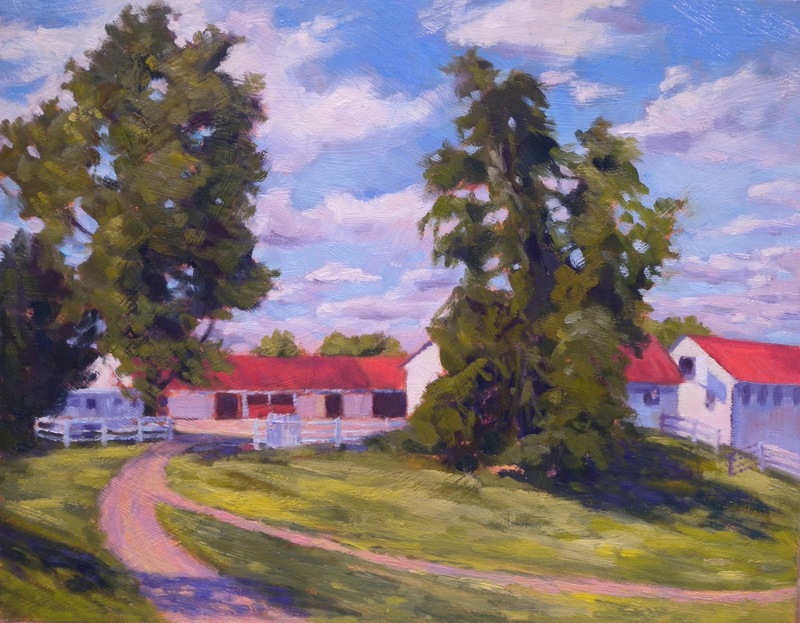 You may recognize the scene in the background from my "Farmhouse" series. 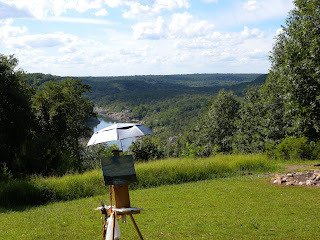 I have learned to keep my painting gear packed so that when the occasion arises I am ready. 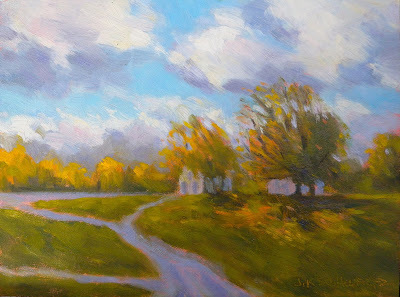 This week the weather and skies were wonderful so after my time with Gypsy I set to work painting. Rather than spend valuable time traveling to different sites I have decided to focus here for awhile. 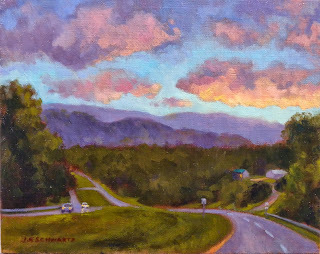 There is no lack of subject matter and I get to feel good about spending the time out painting and at the same time keep a handle on my time. The more I paint here the more ideas for future paintings I have. I think it has something to do with my connection to this place. I have had horses here for over 30 years. 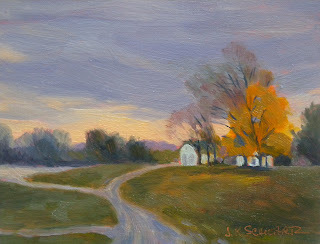 I know and love the place well and I hope that will come across in the paintings. The painting below is the most recent one and was painted the day before yesterday on a fairly breezy afternoon. 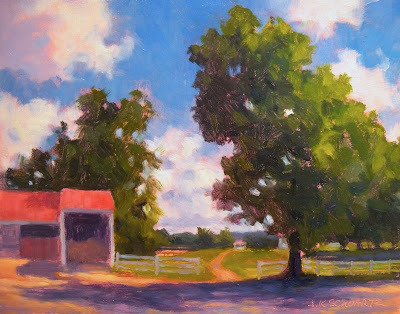 I had set up my easel under a walnut tree which kept me cool and gave me shade. It also gave me a knock in the head:) It is early for the tree to be dropping it's fruit but the breeze was strong enough to knock a couple of walnuts free. I took one to the head and one to the shoulder. My only concern was taking one to the palette! That could have been a mess but happily my palette remained walnut free. Also still on exhibit is the Summer Potpourri Show online at the Salmagundi Show. I will give links at the end of this blog entry and if you should visit this exhibit online I am on page 17 (I think, anyway it is alphabetical). 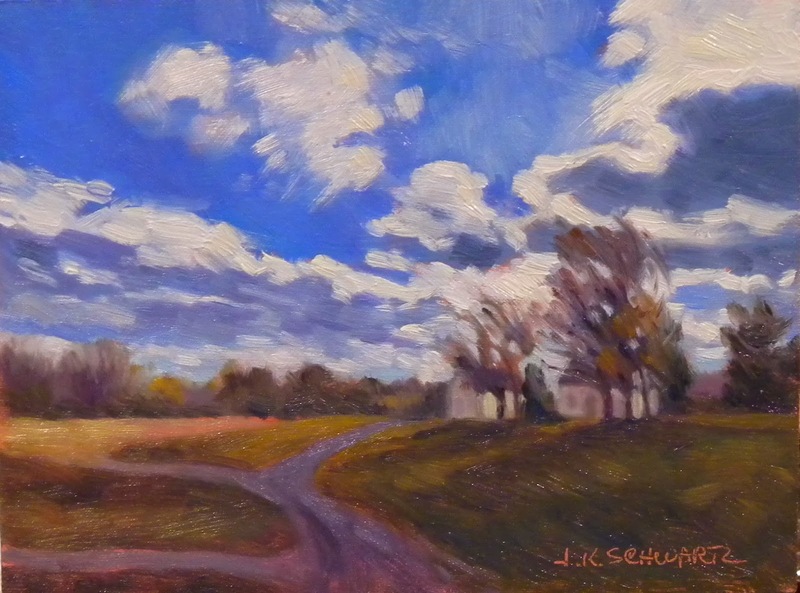 I have one of my "Farmhouse" minis on exhibit as well as "Storm Clouds Over Morven Park". 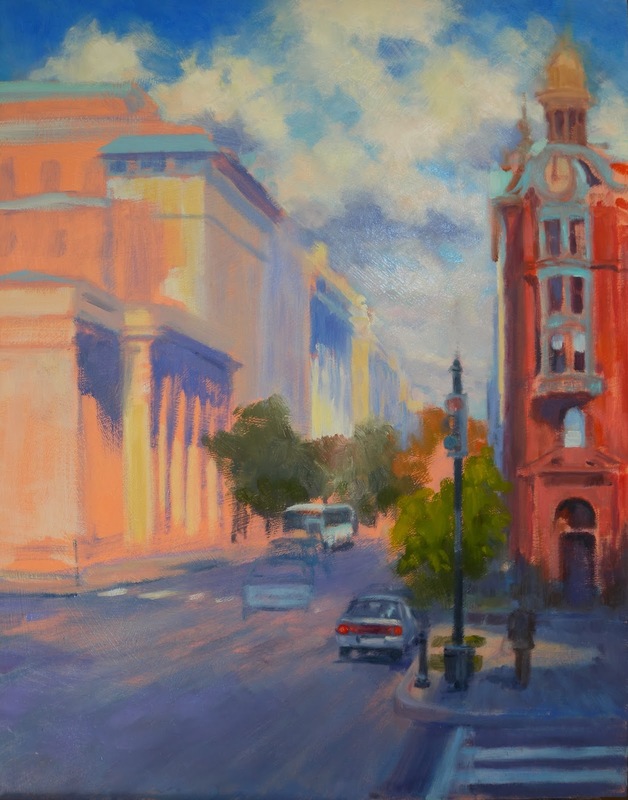 The Salmagundi Club is undergoing a massive renovation so in house exhibits are temporarily on hold. You might enjoy seeing the photos that have been posted of the work in progress on this wonderful, historic mansion. 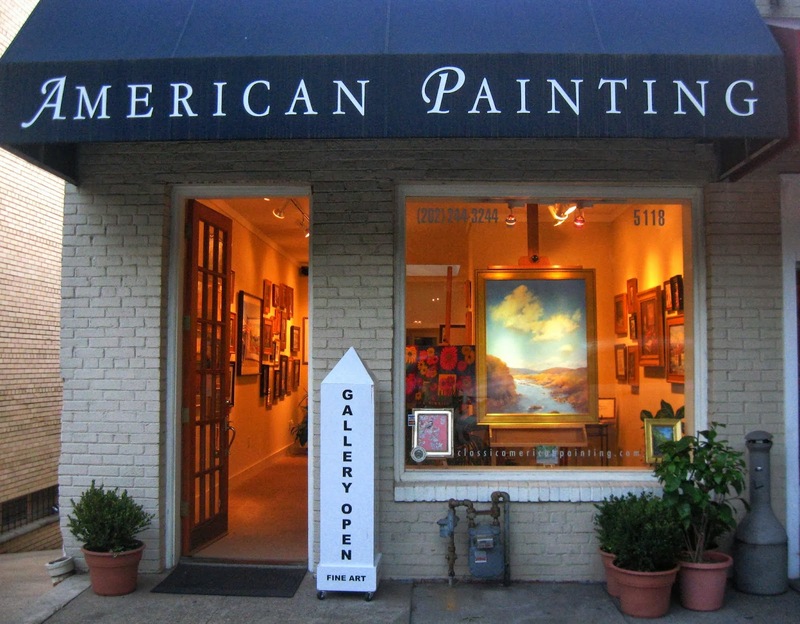 Another show that continues into September is the "Art of DC" at American Paintings Gallery on MacArthur Boulevard in DC. I still have four paintings left in that show which is a Washington Society of Landscape Painters exhibit. Lastly there is River District Arts in Sperryville Virginia where "Blue Ridge" is on exhibit until September 29th. If you want to take a Sunday drive into some gorgeous country this is only about an hour outside of DC. This show is also a Washington Society of Landscape Painters exhibit and it is a beauty! 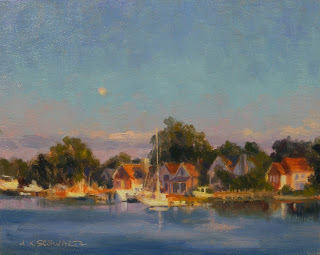 I should also mention that the Oil Painters of America Summer Salon Show continues until August 31st but I don't think you can view it on the OPA site any longer. 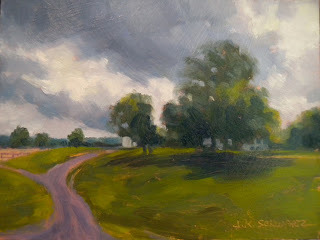 My painting from that show did sell and I look forward to hearing where it is off to. We have been having one of the best summers on record here in the Metropolitan DC area. In any case that is my opinion. I spend as much time as possible outdoors which means I am getting behind in paperwork and things such as this blog. I am painting and drawing, usually well into the evening. Good thing too because there are a lot of shows this fall and I need to be ready. There are three "small works" shows that I am creating paintings for. 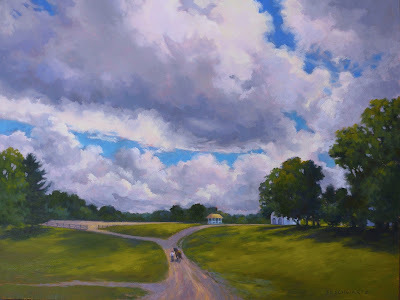 The little one above is a companion to the "Pennsylvania Avenue" painting I showed you a couple of posts back. In this one I am facing the opposite direction. 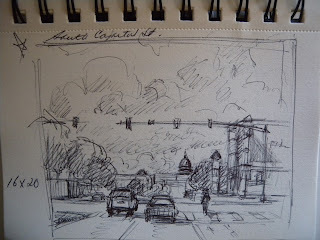 This came out of a day long sketching excursion to Pennsylvania Avenue last Monday. It was cool and breezy and a wonderful place to be. Washington DC empties out in the summer, big time! It took me 10 minutes to drive from my house and park immediately. In a couple of weeks that won't happen. My friend Susan and I started at 13th Street near the Old Post Office Pavilion and worked our way down to 7th. 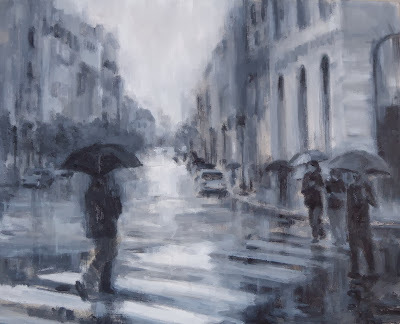 That is the cross street you see in this painting. On the left the old 19th century building is where the photographer Matthew Brady had his studio. 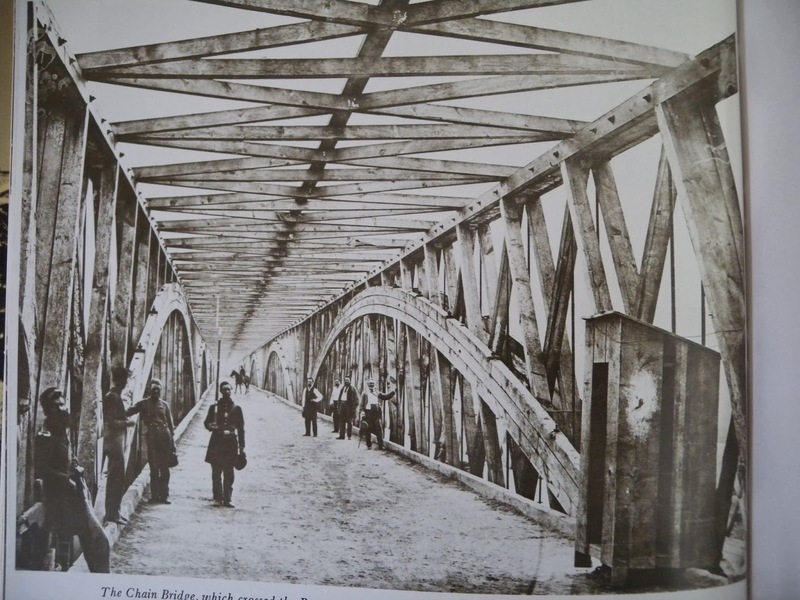 I am sure you are familiar with his photos from the Civil War. I had three sketch books with me of different sizes and weights of paper. I worked in pencil, Prismacolor markers and ball point pen. This painting came from a quickie pencil sketch in my 4x6 inch sketchbook. 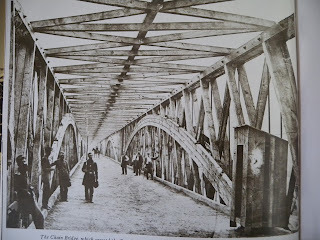 Traffic was so light that you could stand in the crossing for awhile. Actually, at 13th there was construction in the middle of the road and traffic was diverted around it. Had I known, and if the construction company agreed, I could have set my easel up right in the middle of the avenue! Ha! I won't even try to delete the little x in the box above as that was my first attempt to upload this photo. If I go back I wil be gone. What a pain in the arse! Anyway, this is my vantage point from yesterday and it was a spectacular day! The most ideal summer weather! 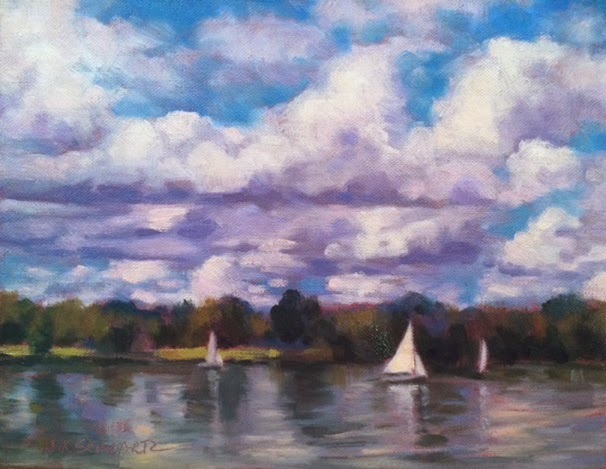 I was able to finish the painting in one session and I am always happier with the paintings that I can do in one gulp. They are fresher that way. ﻿ Here is a better photo of the painting I posted yesterday. I made some tiny adjustments to the painting and I am quite pleased with it. I will save this for one of the small works shows I plan to enter in the fall. 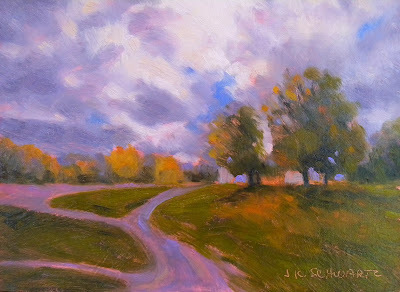 This is an example of one of my "from the road " paintings. I posted about that at the end of my July 15th entry. 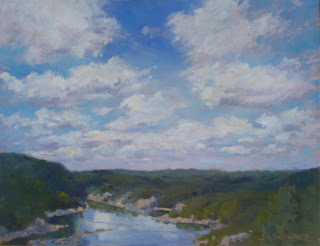 What it means is a painting from a vantage point that does not allow me to set up my easel or even have time for a small study in a sketchbook. In this case I was in the middle of Pennsylvania Avenue clicking off a quick photo before the lights changed and the traffic came bearing down on me. So, a photo and then pencil or water color studies to help me decide on whether or not to do a studio painting. I liked this one and decided to do an oil study rather than watercolor. My intention was to use this for a larger painting but I am not sure that is wise. Sometimes I know I can improve on the study other times I am not sure. This one hits the mark for me and I hope it does for the viewer. I might be better served to use what I have learned from this one and do a different view if I go larger. The painting above is "Rosslyn at Dusk", 12x24 oil on panel. 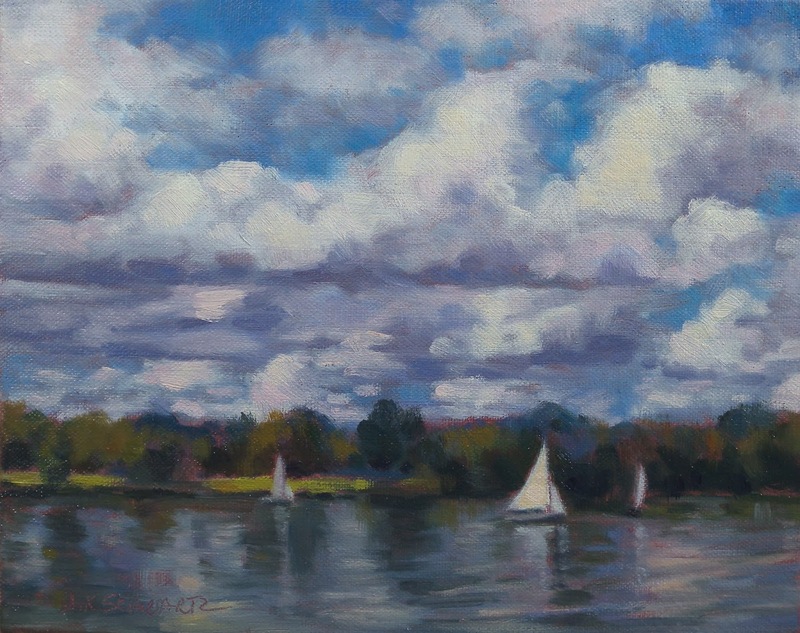 I am happy to say it sold last week at American Painting Gallery in DC and it will be residing at a law firm downtown. 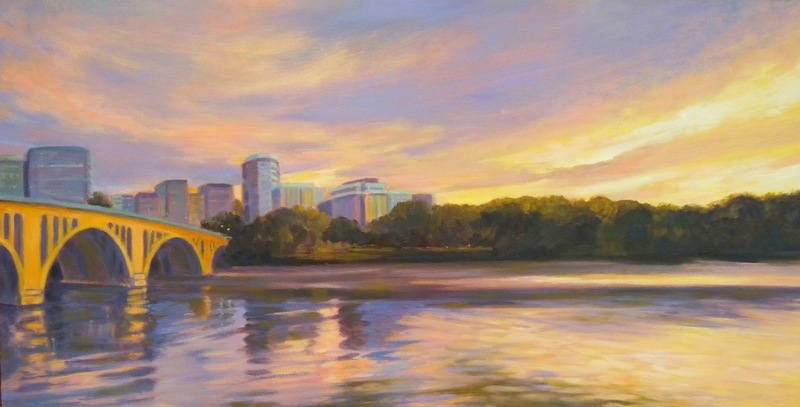 It was one of my first attempts at a cityscape and the fact that I included the Potomac was my way of getting my feet wet (bad pun) with depicting an urban subject. My other two cityscapes done around the same time are those which my recent posts showed you. Those were NYC paintings. 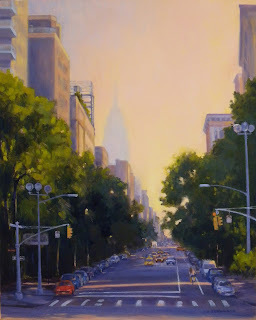 I have become more and more interested in painting city and town paintings. 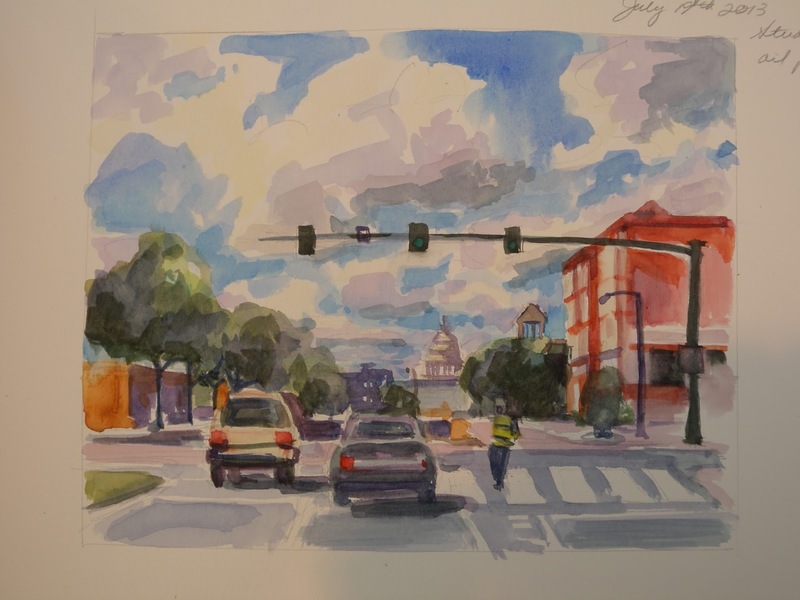 I have joined a Facebook group "Cityscape Paintings" started by a fellow Salmagundian and have been drawing inspiration from it. 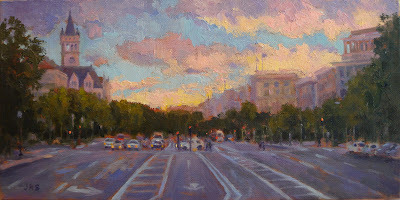 I have posted this painting as well as "Morning, Washington Square Park" and "5th and Waverly". It is good to have feedback from fellow artists. It is also good to study the very high quality paintings by other members of the group as well as the more famous paintings from the last century that are often posted. This is an example of how great a tool the interntet can be for the artist. 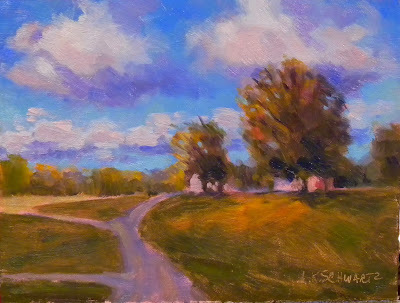 This afternoon I painted this little study for a larger painting. It needs some tweaking and an improved photo but you can get the gist. 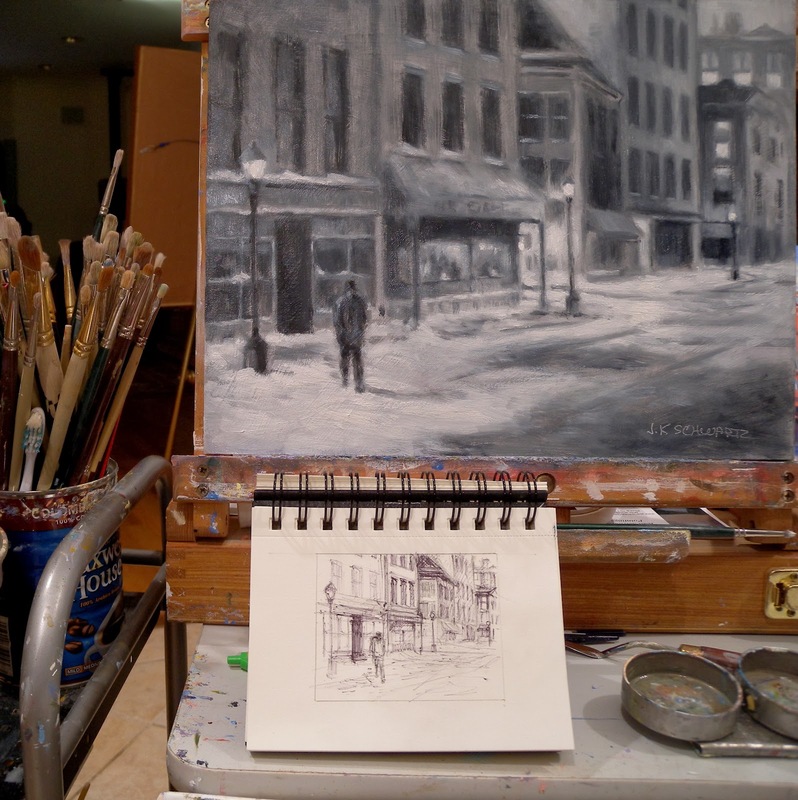 On the left of the painting is the Old Post Office building which now houses restaurants and shops. 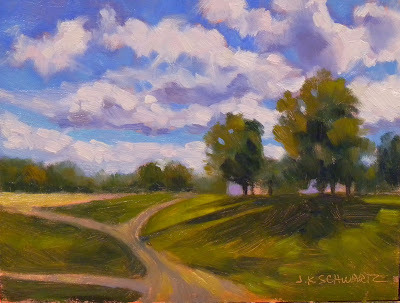 I want to paint the Washington I know as more than just monuments. My enthusiasm for the subject is growing! CLOSING THIS WEEK: "Celebrating 100 Years", The Washington Society of Landscape Painters at the McBride Gallery in Annapolis MD. 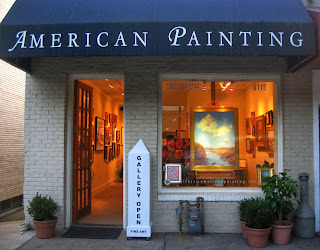 www.mcbridegallery.com http://wslp.org You can see all the paintings in the show on either of these sites. 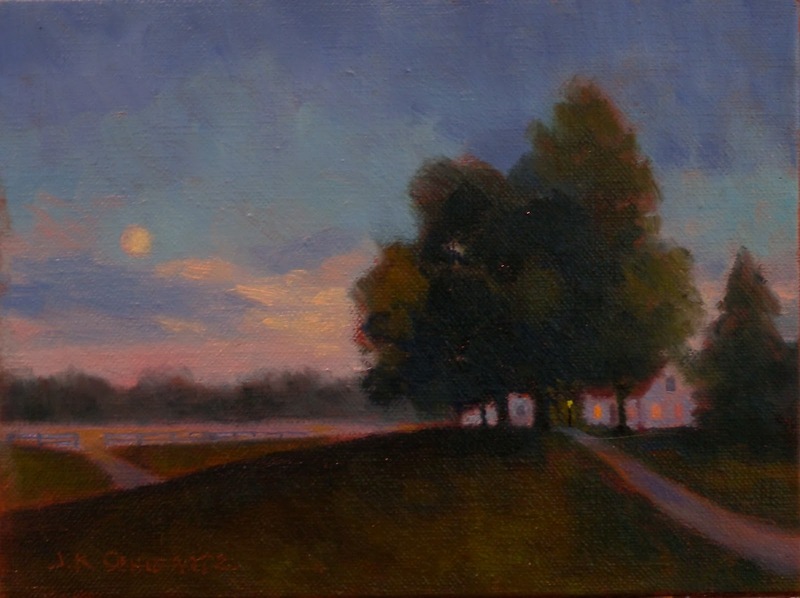 Also check the WSLP site for information on our upcoming show opening on August 3rd at River District Arts in Sperryville, VA.
﻿﻿﻿ Finished, except for one little thing. The figures on the path did, indeed, drive me nuts. I don't want them to look too finished but I also didn't mean to eliminate the horse's right hind leg:( You can see the suggestion of his right fore but when I was making adjustments I forgot to put back a tiny stroke for that hind leg. So now I am happy except for the three legged horse. I guess I will do that tomorrow. Oh good, yet another opportunity to mess it up. Issues with Blogger continue so I will be brief. What I intend to work on next is another "from the road" painting. I call them that because there are times when I am driving and I see something I want to paint but even if I could return to the scene there is no way I can stand in the middle of the road and paint it. Returning from the opening in Annapolis I was fortunate to have my husband driving so I could whip out my i phone and take photos when a subject appealed to me. 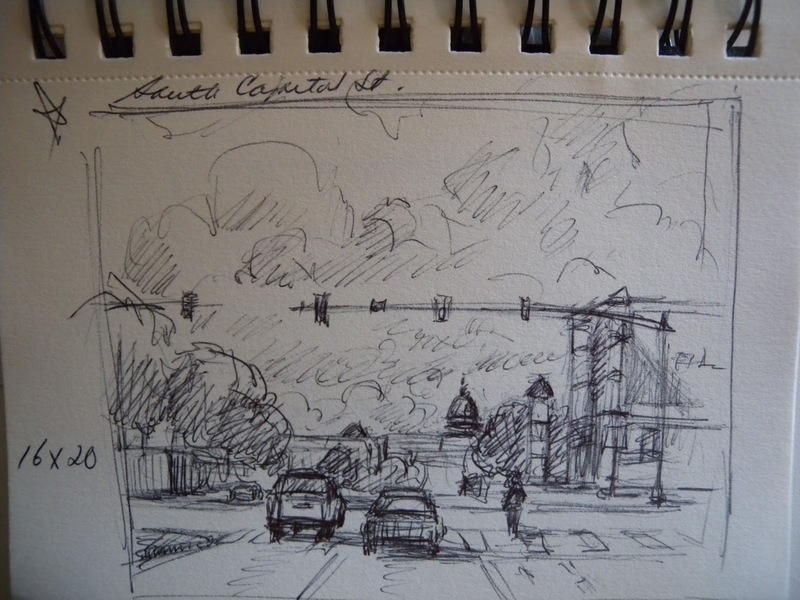 We stopped at a light on South Capitol Street and there was a wonderful view of the Capitol Building in the distance with the huge white clouds and blue sky like you see above. The foreground was a colorful but mundane city street view. I liked the contrast, patterns, colors. There is no way on earth I am painting from the median on South Capitol so I will rely on my photo and quick sketch in my purse size sketch book which I show below. I'll keep you posted. Please check the previous post for exhibition information. I haven't blogged in a couple of days because I am once again encountering technical problems with Blogger. Attempts seem to be hit or miss but I just got lucky so here I am. I wonder if I dare upload a second image as that might be my undoing. The image to the left is "Between Storms" after my second day of working on it. I painted on it again today and it is almost finished. I didn't take any photos so the next time you see this it will be a finished painting. Today I painted out the figure of the girl walking the horse as it looked cartoony (is that a word?) to me. It will now probably drive me nuts putting it back in. The horse looked pretty good so I decided to leave it alone. I have made some value adjustments and worked on the trees on the left side of the painting as well as adding details such as the fencing around the paddock and improving the two structures shown. I haven't touched the sky. My only concern right now is whether to leave the two figures in or not. Somehow I feel they should be there and perhaps I will feel better about them after I repaint the girl. 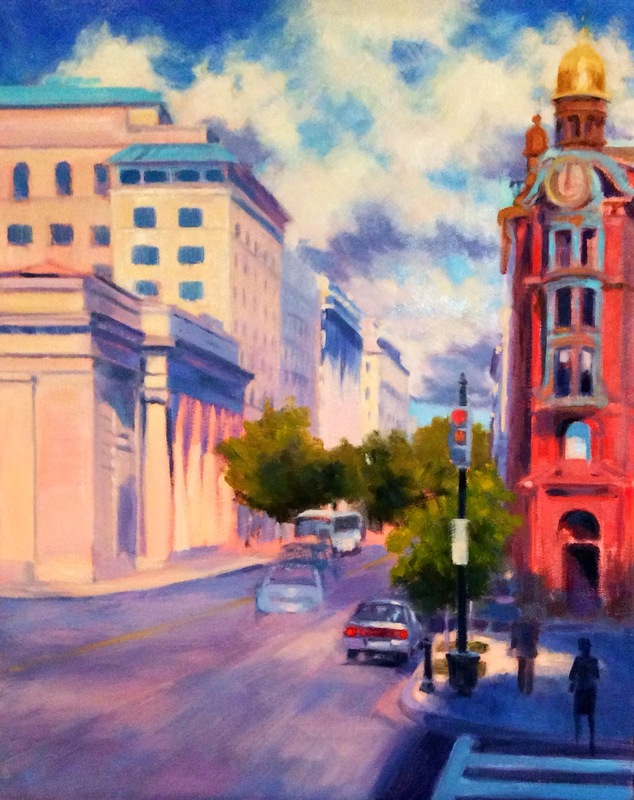 In my last post I mentioned that I had sold "5th and Waverly" and it is now residing in LA. The day after that post I received a check in the mail for my painting "Morning, Washington Square Park", which sold at the Oil Painters of America Summer Salon Show in Petoskey Michigan. I do not yet know where it is off to and hope to hear about that soon. That was the companion piece to "5th and Waverly". 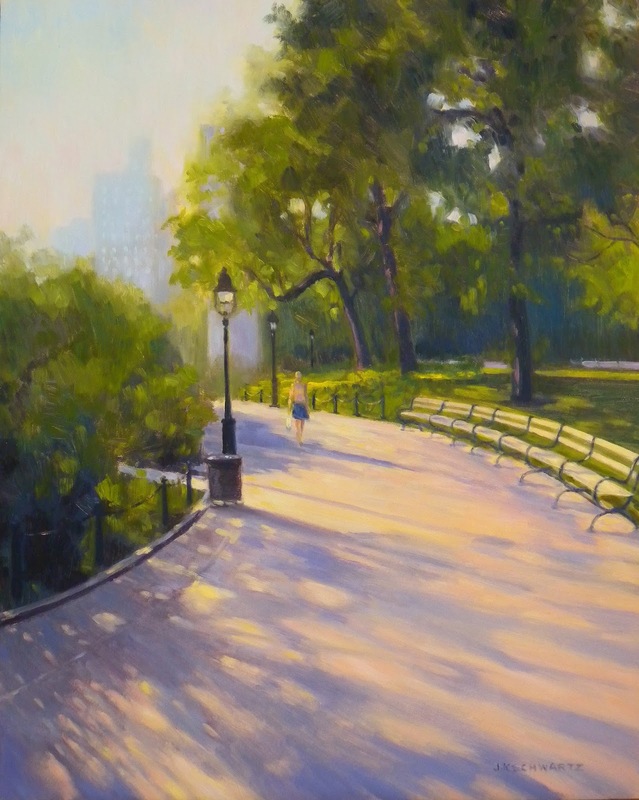 Both were inspired by the same summer morning in Washington Square Park. I will miss those two as they were both favorites and I liked to refer to them from time to time when I got stuck on other paintings. I think they were two of my best! 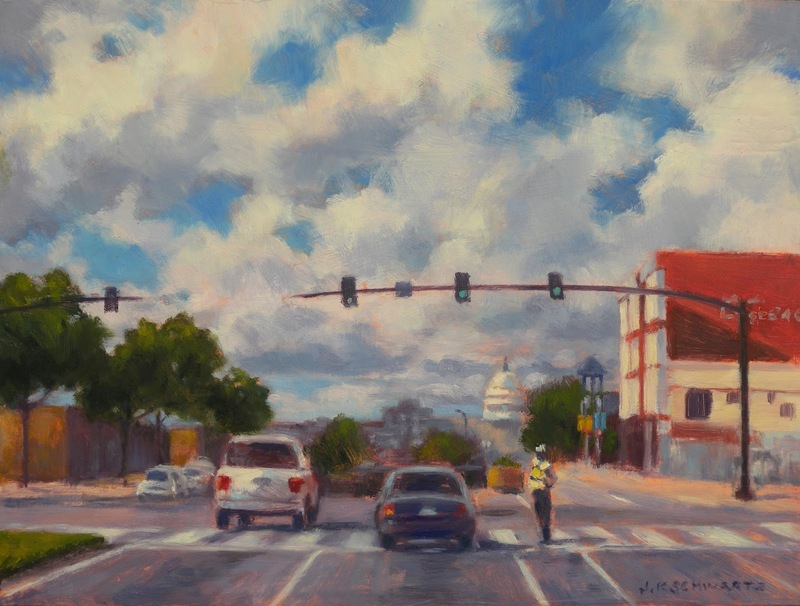 ON EXHIBIT: "The Art of DC" at American Painting Gallery on MacArthur Boulevard in DC continues until September. 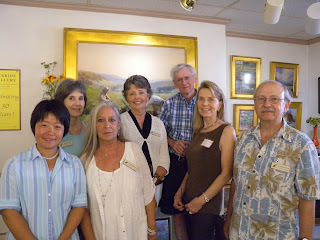 I have six painting on exhibit there. "Celebrating 100 Years" The Washington Society of Landscape Painters exhibit at the McBride Gallery in Annapolis, MD is on until July 28th. I have two paintings in that show. "Morning Washington Square Park", 20x16 oil on panel SOLD! I did a number of posts about the progress of this painting, "5th and Waverly", back in September 2011. Since then it has been one of my favorites. I am pleased that it is moving on to a new home in Los Angeles but at the same time I am sad to see it go. While I still have it I have taken a number of up close detail photos of it for future reference. This is part of the business of art. I create these images to share not to sit in a closet. Painting and selling a painting is an achievement. 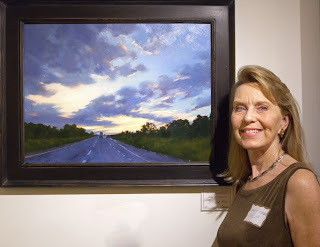 Also part of the business of art is publicity for the work and exhibiting it. 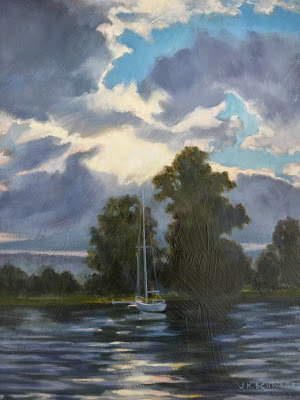 That is what has been absorbing me the last week and I am eager to put some of that behind me and get back to the real business which is painting! I have a lot on exhibit and now I want to be alone with my easel. I have so many images running around in my head that what to paint next is not a problem. The problem is what do I want to paint most! 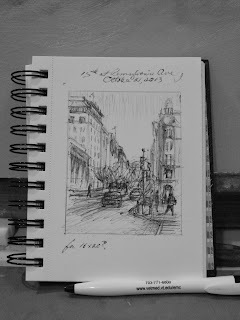 I have "Between Storms" to finish and I have begun sketches for future paintings, city, country, beach. WSLP members from left, Hiu Lai Chong, Barbara Nuss(President), Lani Browning, Nancy Tankersley, Bill Schmidt, Me, Andrei Kushnir. We are standing in front of Hiu Lai's beautiful "Autumn, Sky Meadow"